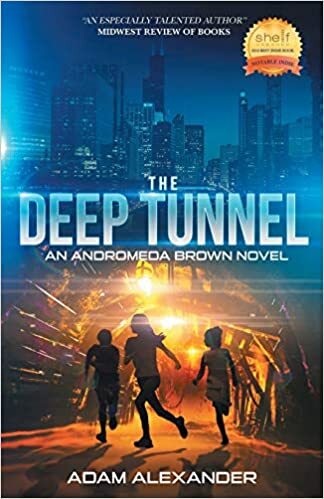 The Deep Tunnel by Adam Alexander is the second book in The Andromeda Brown Series. The plot based on alien invasion on Earth where three kids try to stop an attack. I really like the cover page. The title is simple and goes perfectly with the storyline. The main character Andromeda Brown, DeMarcus, and Mhairi are 13 years old. They fought with Kulrada (evil aliens) in the previous book The Shifter's Trail. In this book, the author continues their story by showing their school life struggles. The kids lead two lives one with humans and others with Grrrmmbls (their friend from another planet and mortal enemies of Kulrada). Everything goes perfectly, but the city suffers a sudden rash of earthquakes. Meanwhile, the conspiracy of viral videos of a fortune-teller named The Mother Confessor makes things worse. Two people found dead in the deep tunnel near the lake. Everyone is making different assumptions, but no one knows the real reason. In the series of events, Andromeda learned the truth about her mother's death, and it breaks her little heart. The Kulrada robot keeps an eye on the kids. The Grrrmmbls face the after effect of an earthquake which made them weak. The kids were the only hope to save the world. The 13 years old teenager faces the aliens again with the help of their friends. The story is fast-pacing. The language is simple and eloquent. There are no grammatical errors. The author did justice with the characters. This is my first read of this author, and I really like her way of narration. It's in chronological order and uniform. The story is gripping. Dr. Mann's personality is of a wicked and stubborn woman. I like the way the author describes her. But I feel the nannybot character is a little bit sloppy. Adam Alexander wrote this series keeping the children in mind. If you didn't read the first book in the series, no worries, you'll definitely catch up the things in this one as I did because of the author's detailed illustration. It's a good and recommendable read. Having foiled an alien invasion with the help of some very out-of-town friends, Andromeda Brown's seventh-grade future looks set: boredom at school, extra-terrestrial help with her homework, and hopefully only modest amounts of detention. The world, however, has other ideas. A grisly death in the Chicago sewers can mean only one thing. The alien Kulrada are back. Even worse, her father has decided she needs a nanny. A human nanny would be bad enough, but no human would ever wear so much beige. Andromeda's nanny is a Kulrada robot. Not knowing what Andromeda looks like, the nannybot has been searching for her all summer, and now, somehow, it's cooking dinner in her kitchen while trying to work out if Andromeda is the target it's looking for. If Andromeda lays low, her out-of-town friends will be unable to stop alien invasion 2.0. But if she tries to act, her cover will be blown, and the nannybot will bring Andromeda and everyone who knows her to a very sticky end. Andromeda's life has once again become impossibly complicated. And that's not even counting the sudden rash of earthquakes.